Hiking is a very popular pastime in Northern New Mexico, and it’s easy to understand why! With dozens of incredible Santa Fe hiking trails to choose from and a plethora of awe-inspiring natural beauty waiting around every turn, you could spend days exploring the vast wilderness of our region. If you’re in search of local hiking suggestions, look no further than the Chamisa Trail in Santa Fe. This trail is a favorite among visitors and residents alike and provides a fairly quick and easy adventure that everyone in the family will love. Read on to learn more about one of our favorite hiking trails in Santa Fe and other popular hiking spots that you won’t want to miss! While you’re here, don’t forget to request your FREE copy of our Chimayo Vacation Guide to discover even more fun things to do during your stay with us including outdoor recreation opportunities, dining, entertainment, shopping, and more. Download Your Free Guide to Northern New Mexico Right Now! The Chamisa Trail is a moderate-level hike through the mountains of Santa Fe. Although it is primarily a hiking destination, mountain bikers can also get their fix on the trail. Since it gains quite a bit of elevation on the way up the mountain, rookie hikers may find the trek to be quite challenging. However, the rest of the trail is a relatively easy journey and provides its travelers with stunning views. Since there is so much to see, you have the option of making your adventure down the Chamisa Trail in Santa Fe a short or all-day activity! Along the way, you’ll discover beautiful wildflower fields, aspen forests, and much more. The best months to embark down the trail are April-October when the weather is typically warm and beautiful. From the Santa Fe Plaza, you’ll follow the Santa Fe Trail to Washington Avenue. When you cross over Paseo de Peralta, it will become Bishops Lodge Road. From here, turn right onto Artist Road and follow the signs for the Santa Fe Ski Basin. Drive 5.6-miles, and the gravel parking lot will be on your left. If it’s full, check overflow parking to the right! Many hikers choose to begin at the trailhead, but bikers may find the end of the trail to be the best place to start. During your trek, you’ll climb through well-shaded forests, cross dry streams and meadows, and even intersect with the Winsor Trail in Santa Fe. To get back to the parking lot, you must turn around and retrace your steps. Completing the trail and then making the return hike could take the entire day, so be sure to pack accordingly and wear comfortable shoes! Stretching approximately 5.8-miles through the mountains of Santa Fe, the Atalaya Mountain Trail is one of the most frequently traveled hiking trails in the region. After a quick trek through lovely aspen forests, you’ll be rewarded with a spectacular view from the mountain top! Traversing through the Santa Fe National Forest, the Aspen Vista Trail is a lightly-trafficked route and one of the longest hikes in the area. Many explorers are attracted to this trail for its length and plethora of natural features including wildflower fields, a river, waterfall, and lake. The Black Canyon Trail in Santa Fe features beautiful wildflower fields and aspen-fir forests. The short length also makes it ideal for a quick afternoon excursion outside of the city. 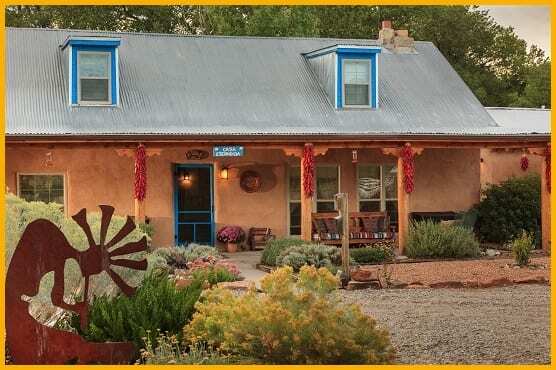 Located just 35 minutes north of Santa Fe, our slice of Southwestern paradise provides everything you’ll need for a memorable and rejuvenating stay in Northern New Mexico. Meaning “hidden house” in Spanish, Casa Escondida gives its guests a one-of-a-kind experience that perfectly combines the old-world charm of the Southwest with modern comforts and amenities. Choose your home-away-from-home among our nine lovely guestrooms, unwind in our peaceful setting within the foothills of the Sangre de Cristo and Jemez Mountains, and fuel yourselves for a full day of New Mexico adventures with our complimentary hot breakfast served each morning.